Worked alone in the garden today. Transplanted the beans from the middle row. The rows were way too close. No way to get inside the middle rows to do anything. There were only five plants in that row anyway so I transplanted them into another row of beans. 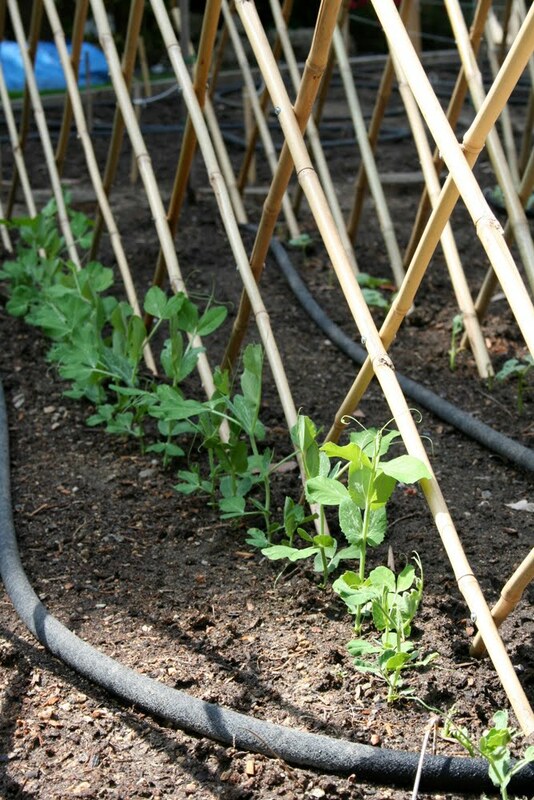 I put the wood rounds as stepping "stones" in between the row of peas and the row of beans. Planted beet seeds where half of them did not come up. Watered everything. Also, added some wood rounds to form stepping places between two rows of corn. I need more of those wood rounds. Foliar-fed all the vegetables and fruit trees today with Spray N Grow, Bill's Fertilizer and Coco Wet. Pulled out one of the fences for the beans. The rows are too close and this row only has 4-5 plants. I will transplant them tomorrow in another row. Then I should put the wood stepping stones in that area. I might also have to reposition the soaker hoses. Tomorrow I will transplant some more tomatoes on the hillside and seed beets. Only half the row came up. Today was transplanting day. 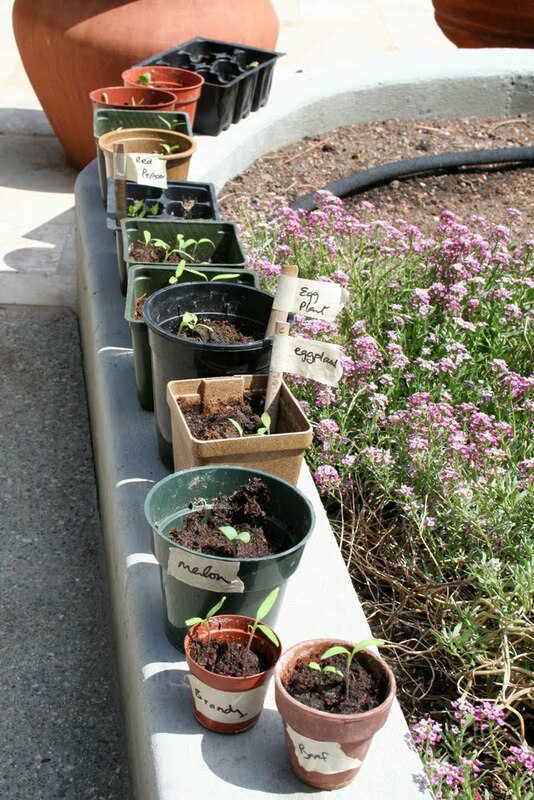 All my little seedlings are big enough to move out of the small containers and into the garden. On the hillside I transplanted one zucchini, one butternut squash, two watermelon and two cantaloupe. Then I transplanted eight eggplants into Garden #1 near the bell peppers and tomatoes. I put Actinovate (a fungicide) and Super Thrive in the water and soaked all the plants well. The weather is getting warmer again, so I watered the whole garden this morning after the transplanting. Tomorrow I will see if there is anything else I can transplant. I also want to plant the chamomile and thyme. The sage has flowered, so I probably need to plant more of that too. Yesterday, I put all the dry herbs (lavender, rosemary & oregano) in small plastic bags, with the name of the herb and date. They are all finally dry enough to put in the bags. Ready for my gardeners the next time they come. Just worked in the garden by myself today. I always enjoy the time I spend there. 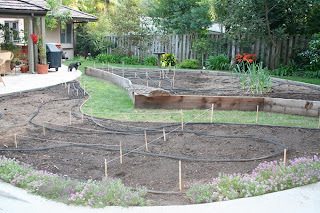 I watered all the areas that were newly seeded. Then I planted a row of chard in Garden #1 where it didn't seem to take. I also fertilized all my gardenias. I do love gardenias. The scent is intoxicating! Just doing the finishing touches to the garden. Planted 2 rows of lettuce where it failed to appear in Garden #1. 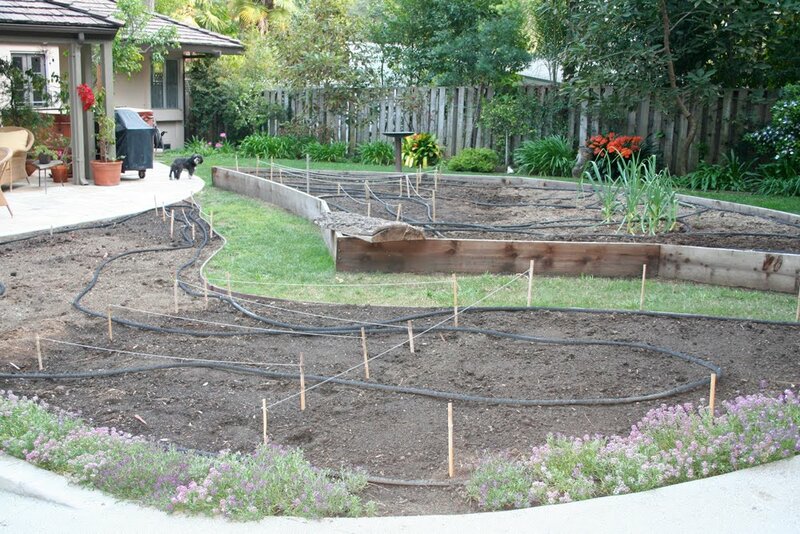 Transplanted Brandywine, Beefsteak and Roma seedlings into Garden #1 along with Tomatoes Alive and SuperThrive. Also transplanted some jalapenos and bell peppers. In the raised bed, planted 2 rows of Kale and a circular section of kohlrabi. Kohlrabi is supposed to be like a radish. Never cultivated it before. We shall see. Today was a spraying day. The first thing to spray on was the Neem Oil, which prevents powdery mildew. I am determined not to have powdery mildew all over my zucchini, squash and cucumber leaves this season. Then mixed up some Actinovate with water and poured it on all the new seedlings and also where I seeded. Finally, a mixture of Spray N Grow and Bill's Perfect Fertilizer, mixed with some Coco Wet to help make it stick and my plants should be growing by leaps and bounds. I have to remember to do this every two weeks, except for the Actinovate, that's once a month. The back pack sprayer is so heavy, but thank goodness I have it. It was cold this morning and very overcast. It's 2 p.m. now and the sun is shining. Thank goodness. Ginger arrived around 10 a.m. to help in the garden. We put up five trellises for the peas and beans. They are looking great! Also planted beans where the seeds did not sprout. I did the same for the peas a few days ago. Planted celery and arugula near the peas and beans. Super Thrived all and watered all. The corn is looking great. All the zucchini, cuke and squash seedlings took up on the hillside. The cherry tomatoes that I transplanted are also doing well. Can't say the same for the bell peppers-3 survived & 3 didn't. Thank goodness I have more seedlings that will soon be ready for transplanting. Only one helper today, Juna, but boy, did we get a lot done. Made a trench for 6 Yukon gold seed potatoes in Garden #1. Covered them with soil and made a mound for each. Planted another zucchini on the hillside. The other plants are all doing well. Planted a 2nd row of broccoli next to the other one in the Raised Bed. Then we planted 2 rows of cauliflower, followed by 2 rows of pak choi. I also planted more peas where they failed to come up. Of course, I Super Thrived everything. Some of t he transplanted peppers did not survive, for whatever reason. Good thing I have more seedlings which will be ready for planting very soon. I also planted basil in 3 containers. We had so much basil last year. I must remember to make more pesto sauce and freeze it for the winter. Seven mounds of earth on a hillside. Each one has a little treasure: zucchini, squash and cucumber all growing on my hillside. That was the project for today. They are all doing well. Also, watered everything. The soaker system seems to have survived one season. Sometimes they get clogged up. So far, so good. I now have seedlings f or corn, turnips, beets, carrots, peas, beans, cherry tomatoes and bell peppers. The Brandywine and Beefsteak seedlings are starting to sprout in their little containers. They will be ready to transplant in a few days. I hope it rains tonight. It would be so good for the plants.